The Robotlegs MVCS Diagram: I have evangelized the benefits of using off-the-shelf-frameworks for Adobe Flash and Flex projects for years. PureMVC continues to be a great choice, but I have been learning more about IOC frameworks with dependency injection (a feature which PureMVC lacks). Robotlegs (RL) offers dependency injection through metatags. I have learned RL and used it on paying client projects in the past year. I am now considering adding it into the my consulting repertoire. RL team member Joel Hooks has been helpful through his great website and guiding me towards great resources to learn more about RL. Today I announce a helpful Hello World project which is instrumental in learning RL and starting your projects (template) as well as a great diagram I created too. I’m working to get both released onto the RL website, but will leak them here for those who would like a peek. 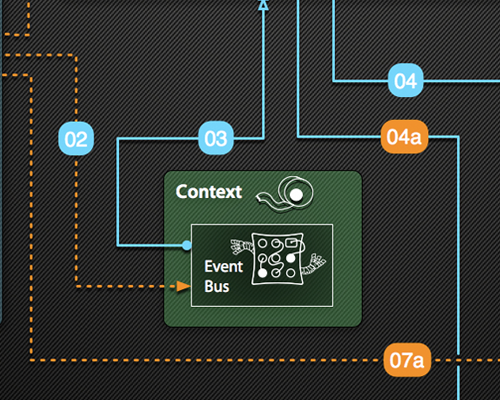 Role: I created the diagram using some existing RL iconography. Downloads The RobotlegsTemplate Project for Flex 4.1 on Google Code The Robotlegs ‘MVCS Class and Flow’ Diagram (v2 jpg, v2 pdf, Older v1 Online) The same template with AS3-Signals added is here.